With the full quality, 100MB version of the previously discussed trailer for the Europe city level of Sonic Unleashed, I thought I'd do what everyone else is doing and look out for some cool, new things hidden away in there, hopefully many of these you won't have noticed or read about before.. When Sonic is homing attacking the Spinner badniks, you can make out this strange green box. At lower res it almost looked to me like something that flew out of one of the badniks, but now you can clearly make out the green shield symbol on the front and a red circular pad underneath it just like the item boxes originally from Sonic Adventure. This is a Sonic Unleashed item box! And the standard shield has clearly made a comeback after its absence from previous 3D outings. It's an odd design though, almost a cross between the classic TV monitor style and the newer design, but the TV box is replacing the glass as the thing that essentially holds the item graphic, with the pad underneath to keep it floating. It might be hard to see where it is, spatially, from these shots, but if you watch, it's floating in the air with the badniks and presumably can be obtained by holding left while homing. Take a look at these guys, who hover ahead of Sonic in the later clips. Here you can see that they're three-eyed, bulked up Egg Pawns, seemingly, hovering by way of two massive jets on their back. Very interesting. What the hell is that red-rimmed circular thing? It's not a spring, it's flat and there's no star on it. Could be a jump panel like those in Sonic Adventure where Sonic leaped between them on the walls by jumping. Also looks like a button, similar to the original, flat and.. button-like designs of old, rather than the abstract floating sphere ones. You may have noticed this already, but these platforms below prove the existence of slower and more careful platforming areas. Here you can now make out a large floating hoop in the middle, much like those in the Advance series, and assuming it provides the same mid-air dash functionality, it appears to get Sonic to the highest spring on the right, from the lower one on the left of the pic. 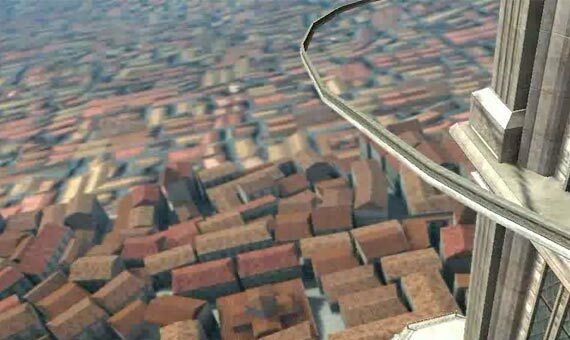 It's interesting that the grinding rail route on the trailer starts at the top and goes down, and seems to run against the direction that these platforms and springs will take you. Perhaps the multiple routes in this game are less a case of short and sweet than we might have thought, if, at one point, they're going in entirely different directions? If you wondered how far all those nifty 3D houses went before they switched to a flat background, there's your answer. Still, you really don't notice it while moving at that speed. 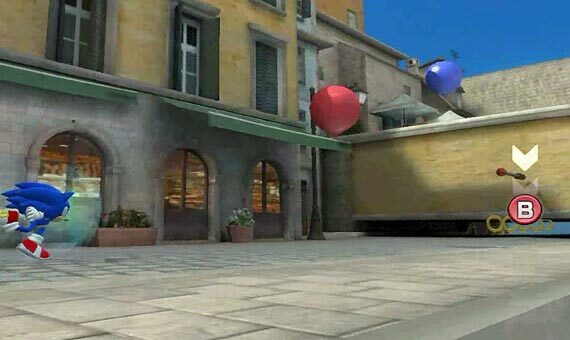 If you've seen the trailer more than once (and I'm sure most of you have), you're bound to have spotted the Carnival Night style balloons all over the place, and I'm hoping they're a level-specific object, rather than yet another one that appears throughout the game. Also note the flagpole there though, popularised in the Sonic Advance series. The team are clearly making use of standard 2D objects, rather than just 2D-ising standard 3D ones, which is good. There's certainly a lot to look for in this trailer, and one of the most interesting and exciting ones that Sega have produced in recent years I think, at least of the ones that are just for pure gameplay, like this. Will post more observations if I spot them. 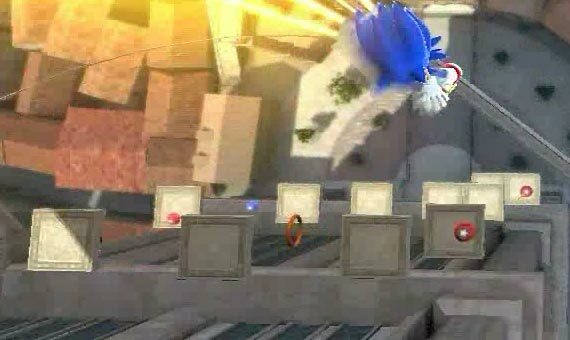 I have to say, despite myself, that Sonic Unleashed looks totally awesome. Personally, I don't think Sonic will ever be truly back on the map until they re-hire Masato Nakamura to do the soundtrack and start drawing Sonic the way they did in the Sonic CD cinematics, but regardless of that Sonic Unleashed looks like it might finally be a worthy successor to Sonic and Knuckles. I promised myself after the series of let downs that were Shadow the Hedgehog and Sonic Next-Gen I'd never be fooled into getting stoked about a new Sonic console title - but I'm stoked anyway. It helps alot that Hashimoto sounds like an intelligent and dedicated guy. I dug it when he said that careful platforming was as much an integral part of Sonic as the speed - something no one has understood since the Megadrive era, in my opinion. I've completely finished up the first five Zones, leaving only Stardust Speedway and Metallic Madness, which thankfully don't have a whole bunch of complicated objects (unlike Tidal Tempest, which took four days on its own!). It's slow work, but rewarding! Favicon's not a bad idea at all! I'll probably make it a teeny little Z:0, rather than a Sonic head or something, so as to distinguish it from other Sonic sites. Cool news about the zones, can't wait to try out the program! Yeah, I kinda hope that's not the name of the level either, but, just in case you've missed it today..
1:59 of pure Sonic brilliance as he races non-stop through the "Europe" level of Sonic Unleashed. I love the amount of variety in there, and sure, it's all running very consistently fast along winding paths and rails and I think there is reason for some concern that the game will feel like it's playing itself, as I've read some people point out today. But I think the developers are realising this and combatting it with Quick Time Events, where you must press a particular button at a particular time to dodge an enemy, skid under or dash straight through something, all while moving at great speed. I'd be worried if this features too prominently so that it becomes a bit like some sort of non-musical Sonic-based Guitar Hero, or some other rhythmic button pressing game that I can't play very well, but it seems to mesh quite well with Sonic's usual gameplay mechanics. As big a fan as I am of the balance between smooth speed and traditional platforming that the original megadrive titles had, I think as Sonic fans in this modern, harsh world where guns have replaced the act of jumping on people's heads and the hedgehog can no longer expect automatic love from reviewers, we need to be ready to accept that things sometimes need to evolve into new, fresher approaches. The Sonic Rush formula has been more successful than any other in recent years, so, a bit like natural selection, that's the mutation that the powers that be are running with now, so to speak. Those in fear of a complete loss of all platforming traditions however should be reminded that there is still the Were-Sonic side of things to be unveiled, said to, logically, operate at a much slower pace. I know, it's not the same, but it's better off present in a distorted form than completely absent. Plus, we've only seen the bits that Sega want us to see, which are more often than not, the fast bits, as that's where Sonic is special. Doesn't mean to say that there won't be slower bits too. I love the amazing speeds of it all, and the behind-view segments requiring quick left and right dashes look immensely fun. I love that powerslide, the wall-kicking and the freefalling sequence down, what appears to be a Dilapidated Way-style sewer. All is not lost with level-specific objects, as we can see spiked and non-spiked rolling barrels, water fountains and especially look out for the returning Carnival Night balloons. I also liked the variation of the floating spinner badniks from Sonic Adventure and Advance 3, which Sonic homes in on, and enemies in general certainly seem to be taking their rightful place in the levels, being one-hit-to-kill, easily disposed of and fairly comical creatures, as opposed to appearing in lots of large gangs and contributing too much to the overall challenge. The large soldiers falling away are very satisfying to watch. Also, I can't not mention those amazing graphics. If the high-end version of the game is capable of rendering all those buildings and details without dropping a frame, then it should be able to handle just about anything. The music, I wasn't that keen on at first, but as with most new Sonic music that I'm initially not sure about, I came round to it very quickly. You can say all you want about concerns regarding where this game is taking the series in terms of gameplay style, but I think most would agree that this is all looking to be a big step in the right direction, and I for one am extremely impressed, and excited. Gameplay looks constantly exhilarating in a way that only Sonic can do, but I don't think this necessarily means a drop in challenge and genuine difficulty, or a game that will play by itself. QTE's should give it a simple, easy to pick up and play, but tough to master quality, and I'm really happy with the balance between 2D side-scrolling and rear-camera "on-rails" stuff that allows them to give us the best of both worlds I think. If Sonic must take the option of a game filled with fast-paced, think-quick button presses and reactions rather than slower semi-puzzles, I for one am happy to run with him and see where we go, but to be honest, the inclusion of Were-Sonic makes me doubt that things will be that black and white anyway. Previous interviews have revealed that Sonic Team are dedicated to this title, and are picking out the flaws that we've all discussed to death and making sure that the likes of too many bottomless bits and waves of tough enemies are being hopefully replaced by excellent variety and challenge, all while keeping a consistent pace and ultimately resulting in what I think could be the most enjoyable and heart-pumping Sonic game yet. I think if this game fails, it won't be through lack of trying. Could still be through lack of time unfortunately, but lets hope that if the developers really need extra time to work things out, Sega will give it to them. If not, they'll be making a massive mistake. On a final, site note, I'm in the planning phases of a massive overhaul to the back-end system that drives this place, resulting in something that is easier for me to edit and progress into the future with when I come to newer games that follow different structures (i.e. ones that don't always have the same two acts and a boss for every character, or even have acts at all). This will also lead to a completely new look for the site, with many new features added, and I've already started designing that, to much satisfaction so far. However, I don't want to make you wait too long for the general pages of Sonic 2, to round that game off, so I've decided to do those old skool for the moment and build them in straightforward HTML, then convert them to dynamic later on. Otherwise it might be a while before anything is actually added to the site, and I'd rather that not be the case. Only a month or so til E3 I believe, so hopefully more Sonic Unleashed goodies then! Enjoy!